Startup SQL Server and if you did it correctly it will startup and be exactly where you were before you made any changes, with all of your user databases online and you should be ready to let applications connect and resume operations. If you screw something up in the above, you still have your backups and you can run setup to rebuild the system databases and then go about following the Microsoft supported path for restoring the system databases and then user databases into the system to bring it online. Essentially the file copy is no different that what would occur through attach/detach you are just doing it with system databases which is not explicitly supported, but it does work. The key is to have your backups from before you do anything so you have the supported route available if you encounter an issue. The only issue I have ever had doing this set of steps is that I didn’t set the file ACL’s correctly and the database engine threw Access Denied errors and failed to start until I fixed the ACL’s correctly. This can save you many hours of frustration and downtime trying to restore everything since the database files are already there and it is just some small copy operations to put them where you need them to be. If you have Diagnostic Manager 9.0 or higher, DO NOT enable the Query Monitor feature for your servers, without first disabling (uncheck) the box to Collect Query Plans (SQL Server 2008 and up only). If you have the Query Monitor feature enabled, check the properties for all SQL Server 2008+ servers and disable the Collect Query Plans (SQL Server 2008 and up only) then do a Refresh Alerts for the server, right click the server in the console and click Refresh Server, to force it to modify the event session and remove the query_post_execution_showplan event. I have already contacted Idera regarding the performance impacts of this event being used in production environments, and have provided images of CPU Usage with the default configuration and after removing execution plan collection, showing reductions of up to 20-25%. I have also been proactively working with clients I know have Diagnostic Manager installed to get their configurations changed to remove the performance impact from any server monitored by Query Monitor in their environments. How Do I Disable this Event/Feature? The idea behind the Query Monitor feature is to collect information about poor-performing queries based on configurable values for duration, logical_reads, CPU, or writes. This is not a bad thing and is something that most servers will want to have configured for monitoring. 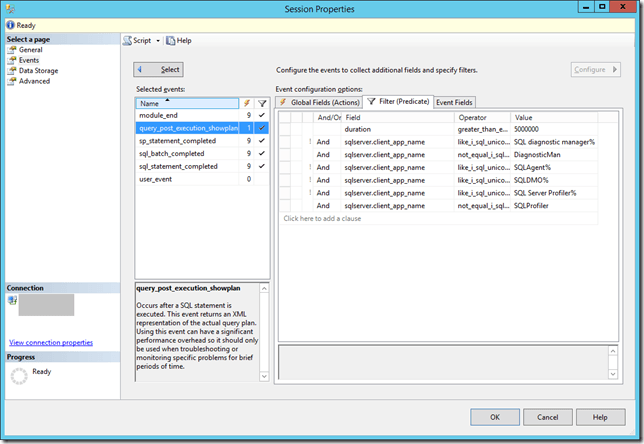 The problem is not with the functionality of the Query Monitor feature itself, but with just one extra event that gets added to the Extended Events session that gets created by default. To enable/disable the Query Monitor feature and change the behavior of it for an individual server, open the server’s Properties dialog from the right-click context menu in the console and click on the Query Monitor page as shown below. 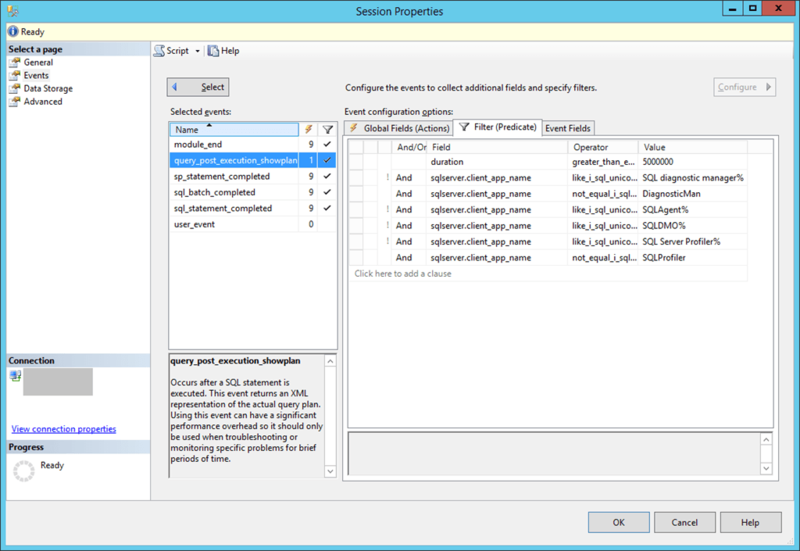 If you simply accept the defaults for the Query Monitor feature, leaving the checkbox highlighted in red above checked, and turn it on for SQL Server 2012 or higher, an Extended Events session called SERVERNAMESQLdmQMEXevents will be created and started on your server that captures the query_post_execution_showplan event. You can examine the entire session for yourself using the Script Session As… CREATE To… New Query Editor Window option in SSMS (or equivalent DMVs in earlier versions than 2012). There is no warning about the performance impact anywhere in the Diagnostic Manager UI and based on the information in Idera’s online forums, Query Monitor gets enabled by default for all new instances unless you remove a checkbox on the Add Server wizard in the UI. For existing servers after an upgrade to Diagnostic Manager that were not previously using the Query Monitor feature, it remains disabled. However, when you go to the Query Details page for that server, a warning message is shown that Query Monitor is disabled, prompting you to click on it to configure the Query Monitor for the server. The purpose of this post is to warn users of the performance impact that this feature has when the defaults are used to enable the Query Monitor against a server, and to at the same time show users how to fix the issue so that Query Monitor can be used to collect important diagnostic information without severely affecting the performance of the servers. I’ve already raised this issue with Idera separately, and I hope to see this event removed from a future update to their product entirely. The performance effects of this event outweigh the cost of having it enabled on production servers, which is why I warn anyone I talk to about Extended Events about this specific events usage in production servers. I think the usage of Extended Events by third party vendors instead of SQL Trace for this type of diagnostic data collection is a good thing overall, but I don’t believe a monitoring tool for performance should ever use an event that can severely degrade performance of a production server. 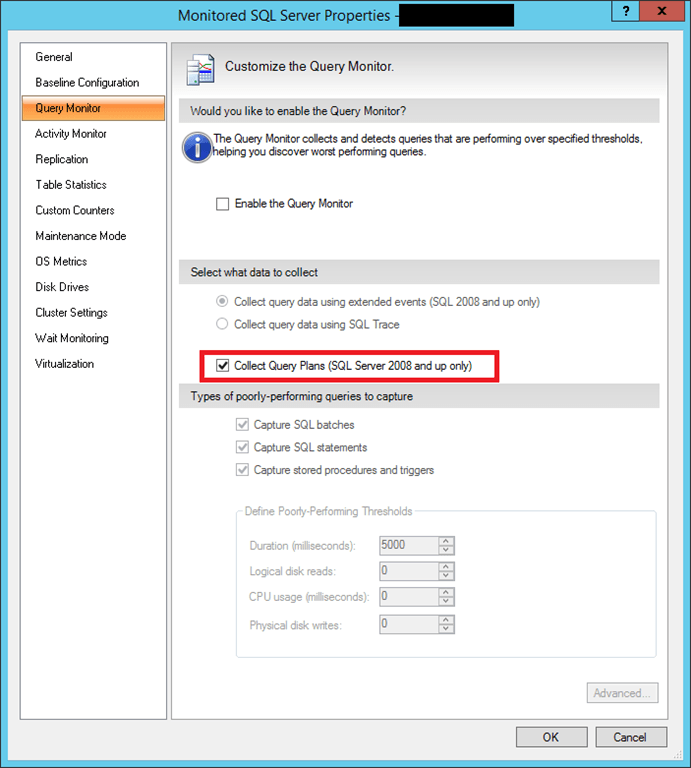 If you use Diagnostic Manager to monitor your SQL Servers, check the configuration of the Query Monitor feature on ALL SQL Server 2012+ servers and disable the execution plan collection or you WILL have performance degradation from the usage of the query_post_execution_showplan event being included in the event session monitoring your server!